Our move here was based on the colour of a car, totally unexpected and unplanned, and yet it changed our lives. We had had a turbulent year, moving from Tunbridge Wells to a small village outside York. Then deciding to give up our company cars. For the first time we were able to choose cars we really wanted, and Stefan had to have a 7 series BMW. He adored the car and as the colour was Biarritz Blue, thought that it was an omen and we should look for a holiday near there, in France. 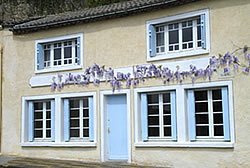 We decided upon a place in the Lot Valley called La Buissiere, and had a wonderful time for two weeks. In fact, so nice, we decided to look for a holiday home. The local estate agent was sure we would be wasting his time so he wouldn’t let us look through his list of properties, instead, he took out a selection of problem properties – or so we thought. All I could tell him was that I particularly liked Puy L’Eveque a medieval village built on the banks of the river Lot and surrounded by the famous Cahor vineyards. 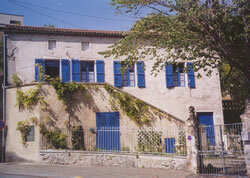 As Stefan, my husband, had previously studied alternative medicine and had taught Tai Chi he was immediately smitten by the first house on our list, one that used to belong to a famous Puy L’Eveque medic and still known as La maison de Dr. Du Blazac. It didn’t matter to him that the house was in a particularly sorry state, he tried desperately to convince me with arguments like Maison de Maitre and “imposing facade with wonderful steps to the front door.” I looked at the 24 steps and wanted a lift. Enormous trees on either side of the house hid the so-called imposing facade. Stefan mentioned the large terraced garden, I saw the years of neglect with knee high pernicious weeds that would be difficult to control and the four large flights of steps within the garden, each one needing a lot of rebuilding. 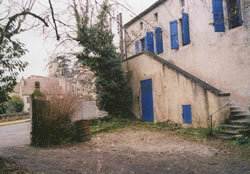 The gite next door was no better. The occupant, a Mother-in-law we suspected, did not turn around to greet us, which was probably a blessing if her long greasy hair was anything to go by. Stefan continued to talk to me in my sleep and so I agreed that this indeed could be our dream home. At the Notary’s office at the signing ceremony, the previous owner must have got belated cold feet as she refused to give us our house key. She did begrudgingly let us in, however. We had felt that the house must be fairly substantially built as we had seen pictures of it in early nineteenth century postcards and it was supposed to be much older even than that. It should last a bit longer, we decided and we bypassed the survey. This may not have been a good move. The roof looked suspiciously as if it was still leaking, this despite having written assurances that it had been fixed two years previously. The house itself was absolutely filthy, but Stefan volunteered his services. Just one half of the loft took a whole day to clear of rubble and rubbish. Stefan came over to the House in February/March 2003 and found that the rain poured in through the roof and every three hours the buckets needed to be emptied. Although convenient for some, the rain would start around midnight and finish in the early hours. He couldn’t complain of course. This was, after all, his dream house. Things gradually improved though, the fabulous hot summers helped and eventually we managed to persuade a very busy roofer that we really should have his help to replace a section of the roof. 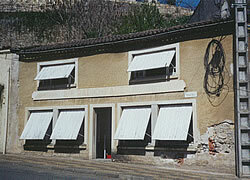 This summer the gite will be ready for business. Lots of the rooms have been completed, and we now know that the rest will follow in due course. Stefan has his surgery ready for Shiatsu and Acupressure Massage, as well as the roof of the garage for Tai Chi. The locals have been incredibly friendly to us, putting notes in our post box for cheap fuel and trying out what little English they know. Nearby, our local Hotelier, Bernard Henry, has been quite wonderful, telling us about customs and helping to get us accepted. Within two months he was inviting Stefan into his home to watch French rugby, a passion here. Stefan insisted that having a bottle of champagne on hand each time didn’t help make his mind up to attend. I am still trying to learn French and take lessons with Marie-France, who helps us with anything and everything. It is going to take some time yet to have a ‘gossip’ with the locals but at least they can understand me now. As for Stefan – well – he looks French so he fits in easily; he also has a knack of sounding French without even trying. 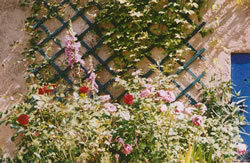 The climate is so good that the ninety odd roses I have and the large amounts of plants that I brought over with me – three large trailers – have exceeded all expectations. The climbing roses, clematis armandii and wisteria covered the house within two years and the courtyard garden is a true English garden. We have just laid thirteen tonnes of gravel to complete the picture. We are here to stay and one day we might even get around to visiting Biarritz! Stefan and Iona’s Gite is now available for rent and further details can be found on their website.. Stefan is a fully qualified shiatsu and accupressure massage practitioner. More details can be found on their website or Stefan can be contacted directly on 00 33 (0)565 21 68 25.